Seven British cyclists will be hoping to defend their Paralympic titles later this year after being selected for London 2012. The 18-strong squad features Sarah Storey and Darren Kenny, who both won track and road titles in Beijing. Fellow track champions Jody Cundy, Aileen McGlynn and Anthony Kappes are also included. Road champions David Stone and Rachel Morris will also be hoping to add to their medal tally. The squad also features first-time Paralympians in former RAF weapons technician Jon-Allan Butterworth, who lost his arm while serving in Iraq in August 2007 and who came to Paralympic sport through the Battle Back initiative, and hand-cyclist Karen Darke, who was left paralysed from the chest down after a rock-climbing accident. Also making their debuts in London will be Mark Colbourne, Lora Turnham, Shaun McKeown and Olympic team sprint silver medallist Craig MacLean, who will be the sighted pilot to Kappes as the team hope to match the 20 medals they won in Beijing which meant they topped the sport's medal table. 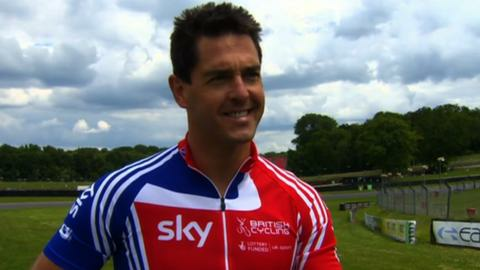 Colbourne broke his back in a paragliding accident in May 2009 leaving him with paralysis to his lower leg but he will be challenging for honours both in the track events at the Olympic Park velodrome, which take place from 30 August-2 September, and also in the road events from 5-8 September at Brands Hatch. "It is an amazing feeling to be selected," said the 42-year-old Welshman, who won a gold and a silver in February's World Track Championships in Los Angeles. "It has been two years of hard work but to actually get to this point is a dream come true for me. "After my accident I was lucky enough to get back onto a bike and start cycling again and when I got the chance to come onto the GB squad a year ago I took it with open arms because I knew I wasn't shy of hard work and knew how fit I could get, albeit with a disability. "A while back if you had asked me about my expectations, I would have been proud and honoured to be part of the team, but now going as a medal hopeful all of the hard work is feeling as if it is a good choice for me. "A lot of the para-cyclists in my class have been cycling for a lot longer than I have and I know I am still improving but I will give it my best shot and I feel confident I can pull out the stops when I need to." Head coach Chris Furber told BBC Sport that the selection decisions were difficult to make. "Before Beijing the squad virtually picked itself on its results and performance, but it has been incredibly challenging this time around," he said. "Qualification was always going to be against us with more weighting towards road events where we are not as strong, but we did our best to qualify as many places as we could. "But we weren't able to qualify places for everyone so we have had to leave out a potential male and female medallist, so it was difficult to decide who would miss out. "It will be hugely difficult to match the achievements of Beijing - everything went exactly to plan for both the Olympic and Paralympic squads there and to replicate that at a home Games with the increased pressure and attention will be tough. "But we've done everything we could to ensure that when it gets to London we are in the best possible position to deliver medals." Men: Jon-Allan Butterworth, Mark Colborne, Jody Cundy, Neil Fachie (pilot: Barney Storey), Anthony Kappes (pilot: Craig MacLean), Darren Kenny, Shaun McKeown, David Stone, Rik Waddon.